Joplin, MO – Charlotte Ann ( Keene) Scheurich, born on October 30, 1933 to Hanson LeRoy & Cordelia Mae (Johnson) Keene passed into her heavenly home on July 11, 2018 at the age of 84. Charlotte was reborn into Christ September 15, 1948 at Strong’s Ranch by brother Floyd Cole, 70 years a servant of the Christ she loved – her 1st love. She was married on Thursday, September 25, 1952 to her one and only love Clarence Anthony Scheurich at the parsonage of the Christian Church in Bentonville, Arkansas. The afternoon ceremony was witnessed by Mark & Mary Scheurich and was attended by minister James Ward. They eloped and were married after Charlotte received a letter from Clarence asking her if she still wanted to get m???. He preceded her to heaven March 4, 2004. Surviving are 8 of her 9 grandchildren: Sandra Anne Scheurich of Carl Junction, MO, Amy Michelle Tracy and husband Tom of Joplin, MO, Cary Alan Scheurich, Jr. of Gilbert, AZ, Adam Christopher Scheurich of Joplin, MO, Brett Michael Knecht and wife Sarah of Phoenix, AZ, Kyle Aaron Taylor and wife Kuralay of Almaty, Kazakhstan, Briana Shay Mosley and husband William of Joplin, MO, Kellen Scott Taylor and wife Caroline of Cave Springs, AR, Brandon Anthony Scheurich preceded her in death May 21, 2006. 10 great-grandchildren: Keynan Isaiah Scheurich, Tanner Anthony Chavez Provin, Madisyn Paige Tracy, Carson Godfrey Scheurich, Brooke McKenzie Tracy, Journey Grace Scheurich, Abigail Anne Scheurich, Laken Kade Mosley, Maddox Anthony Mosley, Camden Scott Taylor and all of her fur babies. Before her marriage Charlotte worked downtown at a five and dime store as a cashier, then worked at Guy Allen’s Diner as a waitress. After her marriage to Clarence she was a homemaker and stay at home Mom. Charlotte returned to the workforce at her cousin’s machine shop after Clarence suffered a sudden illness. She went to work at Walmart in 1974 where she worked for about 20 years in many different roles retiring to spend time with Clarence. She helped in many capacities in the construction business of both her husband and her son and was a master of home repairs. 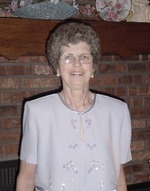 Charlotte was a life-long member of Iron Gates Christian Church of which she was a Charter Member. Her life always revolved around church and church activities and the activities her children and grandchildren were involved in. Services have been scheduled for 10:00 a.m. Tuesday July 17, 2018 at Villa Heights Christian Church, Joplin. Burial will follow at Ozark Memorial Park Cemetery. The family will receive friends during a time of visitation from 6 to 7 p.m. on Monday at Mason-Woodard Mortuary.